In 1500 AD, the Inca Empire dominated the east coast of South America. Further north, the Aztec empire under Montezuma II controlled Mexico and what is now Guatemala. In the center of South America was the Amazon rain forest. Many people lived there in small groups, hunting and gathering or farming. Along the west and south coast of South America (modern Brazil and Chile), there seem to have sometimes been states, and at other times people lived in small groups. These people were very different from each other, but all of them saw a lot of changes in the 1500s AD. The Aztecs were the first to be invaded by Spanish soldiers in 1519 AD. One of those soldiers brought smallpox with him, and thousands of people died of it. The Aztecs’ enemies were soon able to defeat them using an alliance with the Spanish invaders. In 1532, the Inca under Tupac Amaru were overcome by an alliance of their enemies with Spanish troops too. Soon after, Brazil and Paraguay were also invaded, and Portuguese invaders forced the people there to grow sugar. By the 1550s, the Maya also began to suffer from Spanish invaders. 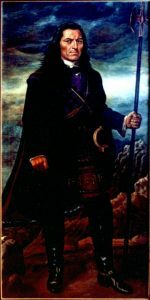 But in Chile, the Mapuche were able to fight the Spanish off. 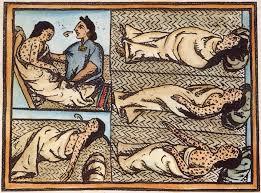 During the 1600s, many millions more people in South America died of smallpox, measles, and other European sicknesses. 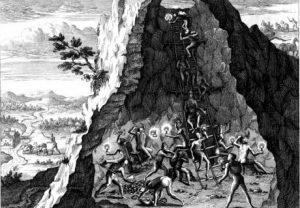 Those who lived had to work in Spanish silver mines, and Portuguese sugar farms, where most of them died from starvation and from working too hard. Still the people living in the center of the continent, and in southern Chile, were pretty much able to go on with their lives as before. Because so many people had died, in the 1700s Spanish soldiers forced millions of West African people to come to South America as slaves. Many more Africans came to South America than to the United States. 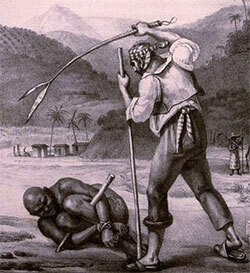 Now these African people worked in the mines and on the sugar farms too. 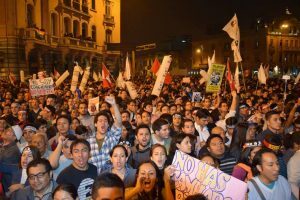 But people in South America like Tupac Amaru II (who named himself after the last Inca emperor), inspired by the American Revolutionary War and the French Revolution, were beginning to stand up for their rights and lead rebellions. In 1809, Bolivia and Ecuador declared independence from Spain. The next year Mexico did too, and then Chile. The Spanish kings were not strong enough anymore to hold on to South America. By 1830, almost all South American people were able to break free of Spain and create their own countries. 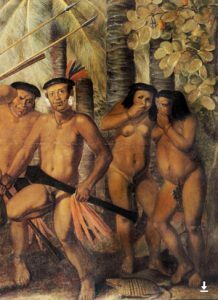 Europeans also began to explore central South America and so the people who lived there died of diseases. Europeans cut down millions of acres of forest. Now that South American people were building their own countries, they had to decide what kind of governments to have. At first most countries gave power only to white men, or only to rich white men. There were many civil wars as everyone else – people of color, African-Americans, women, poor people – tried to get a voice. Some countries tried socialist governments, some Communist, some fascist. During the 1950s, most people in South America finally got to vote – about the same time as the civil rights movement in the United States. Cite this page: Carr, K.E. Central and South American history – colonization. Quatr.us Study Guides, September 8, 2017. Web. April 25, 2019.